Place "Planet Warm terra - What a View!" Did you approach the planet with the G key, or did you fly to it manually? I have a bug to report that involves disappearing planets. Some planets (I have only noticed it in the Milky Way, but I've only seen it on 2 planets total) will disappear when viewed from certain angles. I just ran into a planet with a very similar problem. 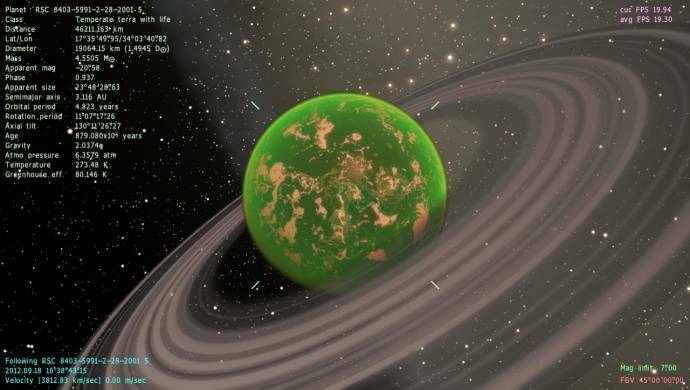 The planet also looks very much like the one you posted, not a mirror image, but it's got the same color features, a ring and is in a cluster, coincidence? I wasn't able to screenshot the glitching out, but it's like a cross between what Harbringer posted and what cyberitalian posted. When I go to and approach the planet from orbit, it's fine, but sometimes when directly landing or moving around, it'll blank out like the planet went invisible, but its usually temporary, but if it doesn't fix itself, going back into orbit fixes it. Also, here's the location for it. I don't think the log will be of much help since it's not a crash, but if theres any common threads, maybe SpaceEngineer will see it. but it's got the same color features, a ring and is in a cluster, coincidence? It is a coincidence because I've also observed this on planets with a completely different appearance. This may be a known issue, but it's just something that bugs me slightly. 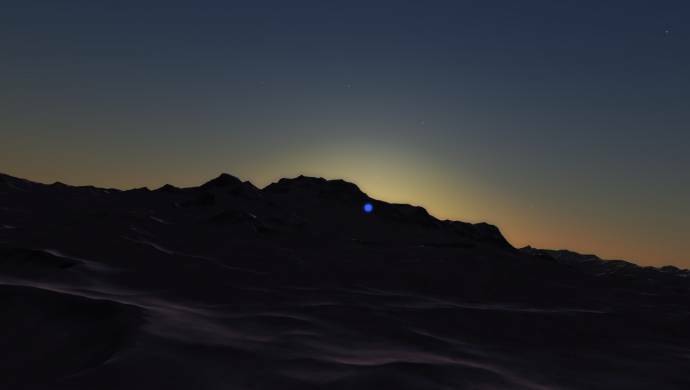 I've noticed that when a star goes behind a mountain, it will still appear as a small colored disk through the terrain. It shows when the diffraction is set to disabled or simple, but goes away with normal and super. Not sure why the supergiant wasn't (besides the fact that it's actually below the horizon) affected in this particular example, but it happens with any star. I've noticed that when a star goes behind a mountain, it will still appear as a small colored disk through the terrain. It shows when the diffraction is set to disabled or simple, but goes away with normal and super. This is because when diffraction is disabled or simple it calculates the difraction disk from light source without taking into account the planet's bump map (plante's anaglyph). I am not 100% sure if this is the correct explanation but that is one logical explanation . the operating system: Windows 7 Home Premium 64 bit. Hello Enigmatic_Lucass, and welcome to the forum. Please take a moment to read the forum rules. As it says at the top of this thread on every page, you need to attach your se.log file with any bug report. Also, why did you use a webcam to take screenshots? SpaceEngine has a built-in screenshot function with the F11 key, and Windows also has built-in screen capture functionality. Please attach your log with your next reply and someone will try to help figure out your problem. This is because when diffraction is disabled or simple it calculates the difraction disk from light source without taking into account the planet's bump map (plante's anaglyph). I am not 100% sure if this is the correct explanation but that is one logical explanation smile . Still a bug/glitch in my opinion. unfortunately, I'm not that Space Engine also has his camera. Well, I already have images from the programme here, the Space Engine, I took the star Arcturus, Betelgeuse and the the Sun. I don't know what it is, that's all I have so badly displayed.Thank you for your help, Space Engine is the best space simulation. PS: Please excuse my English, I'm from the Czech Republic and has the English is very weak. It's not a good idea to post your email on a forum post, even on a forum as friendly as this one, just letting you know. This is an international community, heck, the creator of SE (SpaceEngineer on these forums) is from Russia), so it's okay. Anyways, for your problem, have you checked to make sure that you have the latest update for your video driver? For the SE log, to find it, go to the main directory that Space Engine is in and look for a text document titled 's e' (without the space, I don't know how it would look in Czech), that's the log file Harbringer Dawn was talking about. To není dobrý nápad, abyste mohl psát svůj e-mail na fóru příspěvek, a to i na fóru jako příjemný, jak je tento, jen vám vědět. To je mezinárodní společenství, sakra, tvůrce SE (SpaceEngineer na těchto fórech), je z Ruska), tak je to v pořádku. Tak jako tak, pro váš problém, jste kontrolovány, aby se ujistil, že máte nejnovější aktualizace pro váš ovladač videa? Pro protokolu SE, najít ji, jděte do hlavního adresáře, který prostor motoru je v a podívejte se na textovém dokumentu s názvem "o sobě" (bez mezery, já nevím, jak to bude vypadat v českém jazyce), že je log soubor Harbringer Dawn mluvil. Enigmatic_Lucass, you still need to attach your se.log file. It is in your main SpaceEngine directory. The file name is "se", and the extension is ".log". Renderer: Intel® HD Graphics 4000"
Yes. As smjjames said, your problem is that you're using integrated Intel graphics. If you are using a PC with an Nvidia or AMD/ATI graphics card, follow the link posted in the previous post to fix it.